I – along with most dog owners – am always on a quest. I’m always searching for “it”. “The one.” The one that will be perfect – safe and fun, indestructible and entertaining….I am (of course!) referring to my quest for THE perfect dog toy. 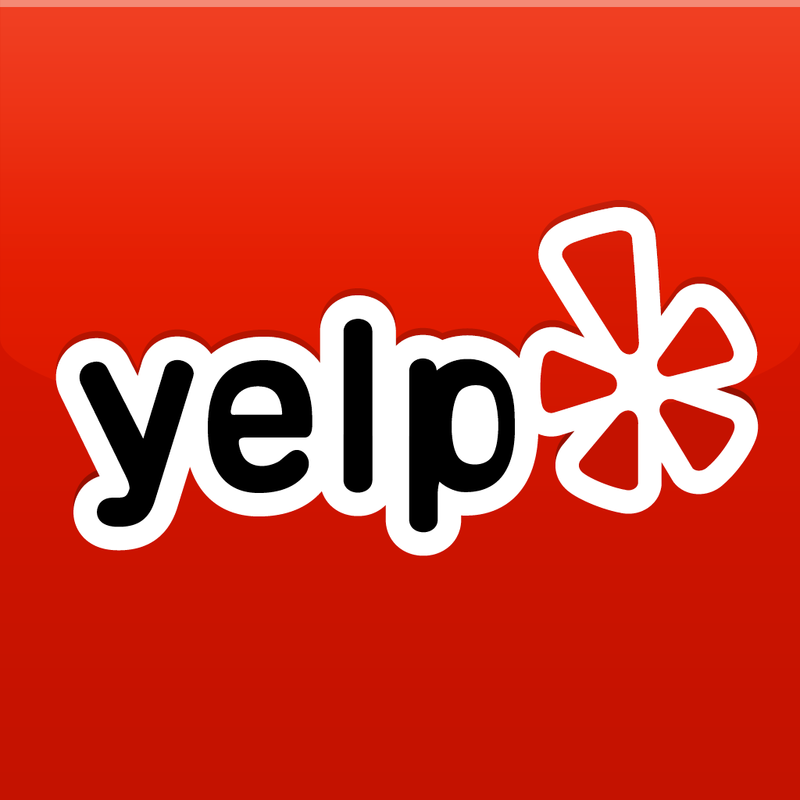 Today, pet super stores, dog boutiques, and online suppliers have made finding “the one” quite a daunting task. I’m very concerned with durability – my pooch tends to rip into things pretty easily, and I’ve struggled more than once to pull one of those little plastic squeakies out of the back of her mouth. While I would love to be able to say money isn’t a factor when buying a toy, let’s get real! I’m not about to throw down $15-$20 for something that will be in the trash by the end of the week (or day!) Most important, though, is the toy getting Buffy’s stamp of approval. Buffy’s all time FAVORITE toy is her “Buffy Ball” (also known as the Hol-ee Roller) I really cannot say enough wonderful things about this toy. 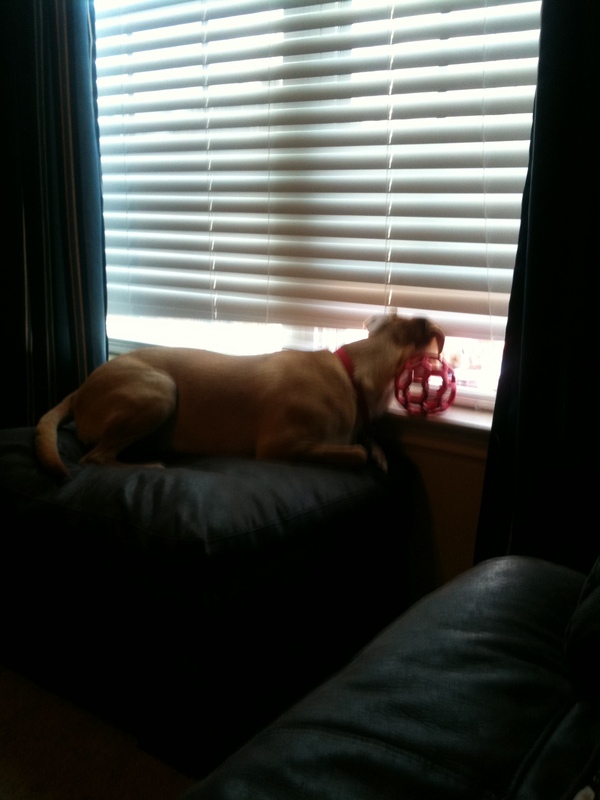 I love it, Buffy loves it….it can be used inside or out….and best of all, after months of use it still isn’t broken (snagged, ripped, or been chewed through.) 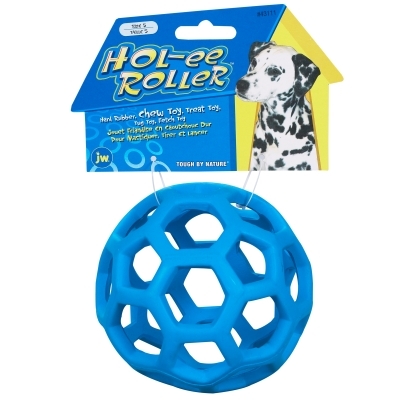 The Hol-ee Roller is made by the pet supply company, JW. Since I had such great success with their brand, I decided to try out their Big Mouth Rings. 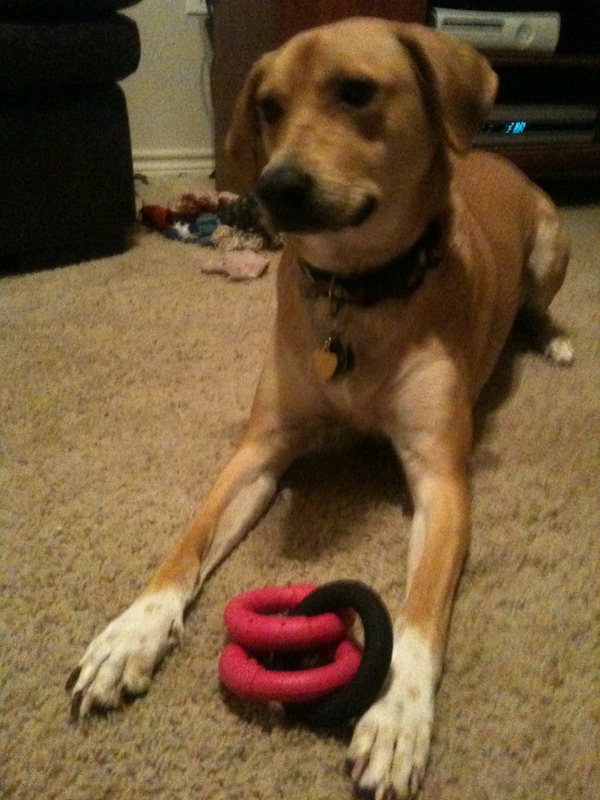 Now, let me just say – Buffy LOVED this toy (in its original state, or now in its three separate pieces.) Though I am annoyed to find bits of black and pink plastic all over my living room, she is still thoroughly entertained by toy. I just find it frustrating to spend money on something that is specifically marketed to “power chewers” that does not last an hour. 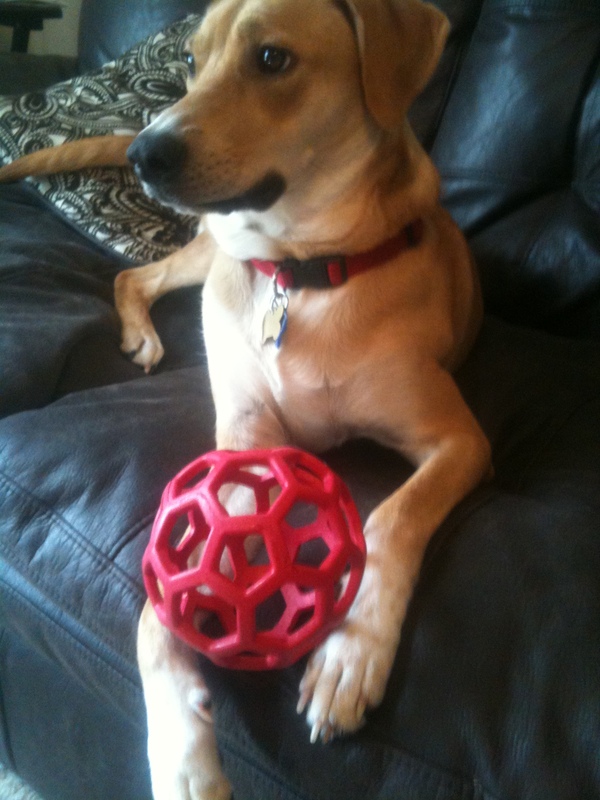 So my quest for a toy as beloved as the Buffy Ball continues…. As a wee little pup, my dog LOVED to play with just about anything: rope toys, plush, shoes that you would leave lying around. Once she began to mature, she started to lose some of her playfulness. When outside, tennis balls were still a sure way to get her going, but nothing seemed to get her moving like the good ol’ days. Nothing until I discovered the Hol-ee Roller. I had seen this toy at several friends’ and clients’ houses and didn’t give it a second thought. A ball with holes….nothing special. On a recent trip to Petsmart to buy Buffy a birthday present, though, this toy caught my eye. Made from 100% natural rubber, this bounce-able toy’s holes make it easy for any size pup to grab onto. Something new and for only around $6…I decided to give it a try. To say that Buffy loves this toy is a complete understatement. She ADORES it. It gets her moving like no other toy I have ever seen. It’s light weight and soft enough I don’t have to worry about throwing it in the house. 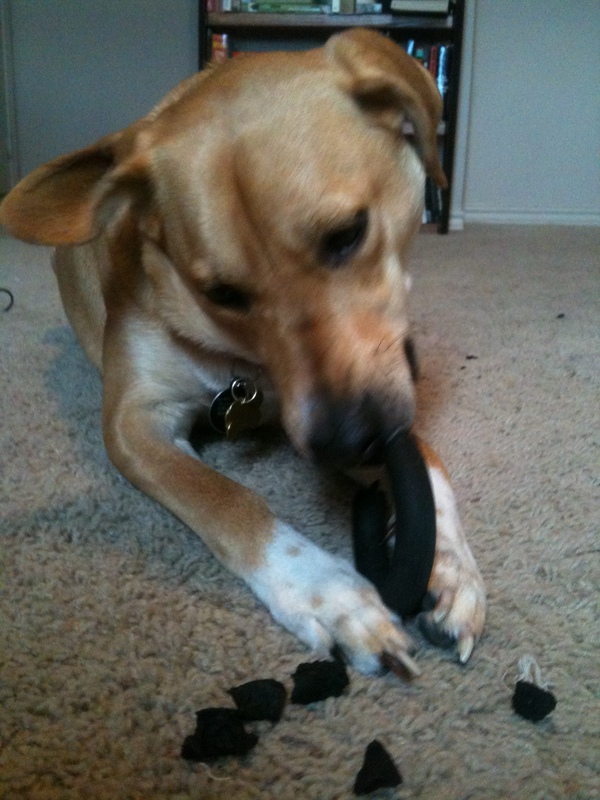 It’s durable enough that she can chew on it. It is one of the few toys I have seen her play with on her own. (As I am writing this she is running around the house with it in her mouth….dropping it on occasion and then chasing after it!) She never likes to be too far away from it – even in sleep. We quickly renamed this toy the “Buffy Ball.” Buffy will retrieve the “Buffy Ball” for anyone who comes over and utters those magic words. Just be warned….you are not likely to get rid of her or her favorite toy anytime soon. I would highly recommend this toy for pups and dogs alike. Hours (and hours and hours!) of fun for just a few bucks. Now Buffy is passed out with it in between her front paws….any toy that can wear my dog out and keep her happy is worth every penny!